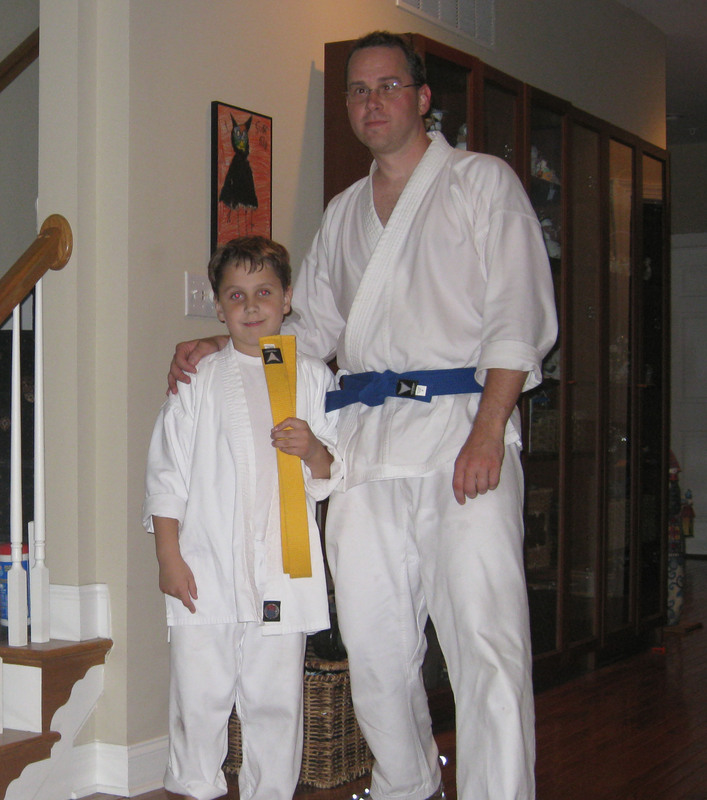 My son Dior and I started Shotokan “hard-style” karate last fall. If you are not familiar with the martial arts, Shotokan is the traditional form of Karate developed on the island of Okinawa and popularized by Gichin Funakoshi. There are many places to read about what this style of Karate is so I’m not going to go into it, but I will say is that it emphasizes strength, speed, and power. The idea is take the opponent down in a single blow. It also emphasizes a code of ethics of non-violence and respect. I’m very proud of our advancement to the next belts; blue for me and yellow for Dior. I’ve been in sports at many levels all the way thru college and semi-pro stuff. Karate is hard stuff – physically demanding. It is a very difficult test to pass and in the world of Shotokan I know our Sensei is one of the best and most respected in the Eastern PA. Having never done martial arts before, I’ve found this to be a very fun and challenging activity. Highly recommended, but it is a real commitment. We are going for black belts! We’ll see how it goes. Right now I’m going to go soak my feet. I enjoyed this article thanks for contributing 🙂 Cheers! Good job! Previous story Instant Messaging: Boon or Curse?